The rising cost line in the latest loss-making financial report of United Company Rusal, the Russian state aluminium monopoly, is under investigation as Rusal’s Latvian bank operations are probed, as well as tax payments in Cyprus. The evidence is being gathered in Cyprus; and by lawyers in London and New York, where Rusal and its chief executive Oleg Deripaska have been accused in court papers of violations of the company’s shareholder charter and management violations. Deripaska denies the claims, while the company reports that as of September 30, it is counting provisions for possible lawsuit awards of $203 million. The evidence for cost controls is hard to find. The company auditors KPMG preface their report with the warning that the accounting depends on what they have been told by company “persons responsible for financial and accounting matters”, and lacks the “assurance that we would become aware of all significant matters that might be identified in an audit.” In KPMG’s notes to the financial data, there are notable signs of rising costs. Despite the loss-making, Deripaska and his “key management” paid themselves 67% more cash in the quarter than they took a year ago. In the nine months to date, they collected $76 million in salary and bonuses, compared to $57 million in the same period of 2011. In Note 21(b), “transactions with related parties”, Rusal reports that the costs of buying raw materials, energy and services of all kinds have been jumping far higher and faster than the main cost indicators of the group. The total costs in this category amount to $416 million in the 3rd quarter; up 11% on the same period of 2011. The 9-month costs for this category come to $1.25 billion, up 10%. It has long been alleged that Deripaska is arranging for Glencore and offshore trading companies he controls to charge Rusal for supplies of bauxite, alumina and other raw materials at above-market prices, and pay the smelter units below-market prices for the aluminium taken for export sale outside Russia. 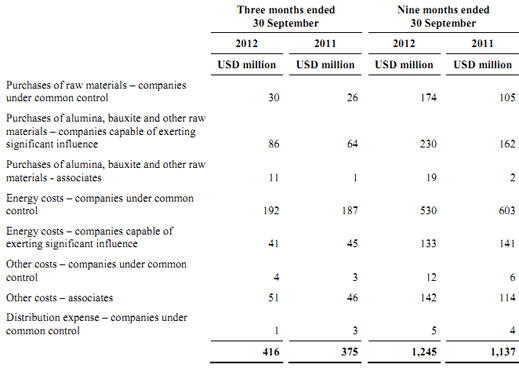 According to the latest financial report, the cost of raw materials, including bauxite and alumina, sold to Rusal by companies “under common control” or “companies capable of exerting significant influence” has jumped to $404 million over the past nine months; that’s a cost inflation rate of 85%. By comparison, Rusal’s press release accompanying the financial report says its cash cost for producing aluminium in the September quarter was $1,936 per tonne; that’s down 0.6% from the June quarter of this year; down 2% from the 3rd quarter a year ago. The cost of alumina, based, Rusal says, “on the daily closing spot prices of alumina according to Non-ferrous Metal Alumina Index FOB Australia USD per tonne”, has contracted to $316 per tonne from $317 in the June quarter, and from $372 in the 3rd quarter of 2011. At the same time as the cost of alumina was dwindling this year, Rusal reports that it cut the volume of alumina it mined by 6.6% (6.1 million tonnes over nine months), and also the volume of bauxite mined by 6% (9.6 million tonnes). Less production at lower price leaves the hefty rise in cost of supply from the related-party companies unexplained. This is one of the targets of the lawsuit now pending in the London Court of International Arbitration by Victor Vekselberg, the former Rusal board chairman who has opposed Deripaska’s trading arrangements with Glencore, and has charged Deripaska with violating his shareholding agreements. Vekselberg and partner Len Blavatnik hold a stake of almost 16% in Rusal. Onexim, the holding of Mikhail Prokhorov with a stake of 17%, is hinting that it too objects to the trading arrangements as a diversion of Rusal revenues. KPMG has also uncovered a curious cost item in the latest report. This is itemized as “ other costs – associates”. It has jumped from $114 million in the first nine months of 2011 to $142 million this year. That’s a cost increase of 25%. There is nothing in the company report to explain it. According to the company, “prices for transactions with related parties are determined on a case by case basis but are not necessarily at arm’s length.” That’s KPMG lingo for the acknowledgement that there’s no telling what Deripaska is spending this money on. The Rusal press office in Moscow refuses to answer this correspondent’s questions and threatens Rusal executives with sanctions if they respond directly. Alexander Bulygin, a former chief executive of Rusal now living in England, has warned that communication with this correspondent is a “declaration of war”. Rusal’s use of the Latvian money-box isn’t news. Evidence appeared in the UK High Court during the litigation against Deripaska by Mikhail Chernoy (Cherney), identifying Parex operations after suspicion of money-laundering was raised by a London law firm and a Swiss bank. 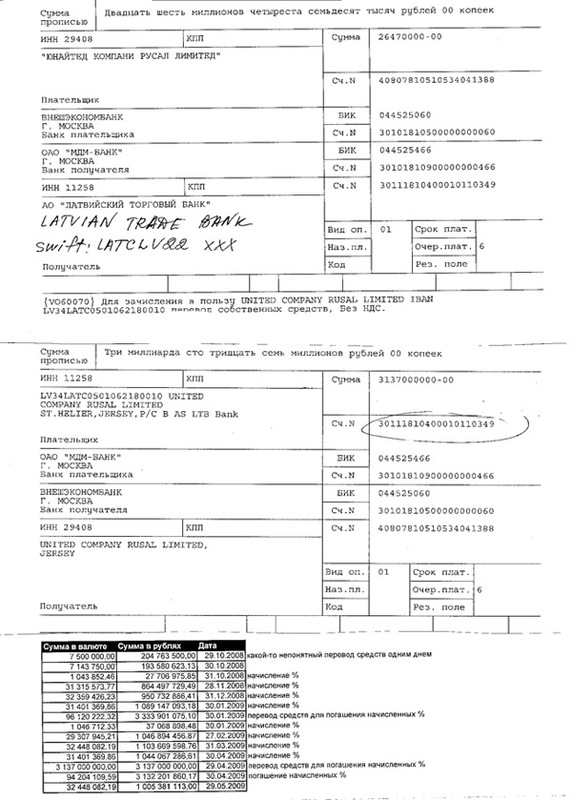 Before that, Latvian Trade Bank (LTB) appeared as the Rusal account holder when the state-owned Vnesheconombank (VEB) transferred Rb121.94 billion ($4.3 billion) in late 2008 to save Rusal from defaulting on its foreign loan obligations, pulling the company back from the brink of insolvency. Evidence presented in the UK High Court during the Berezovsky-Abramovich lawsuit, and confirmed by the August 2012 judgement in the case, showed LTB was a money-laundering conduit. 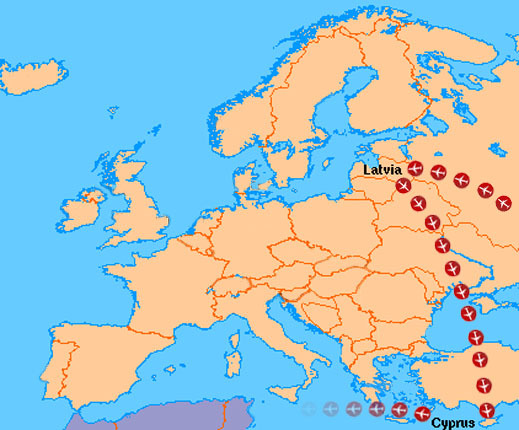 What is now news is that evidence of transaction chains between Rusal companies in Russia, transfers into and out of the Latvian banks, and trading intermediaries registered in Cyprus, is facing tax probes in Cyprus, and money laundering and cash accounting probes elsewhere. In a note on “legal contingencies” in this week’s financial report from Rusal, the company says: “Mr. Deripaska advised the Company on 27 September 2012 that Mr. Cherney’s litigation in London against Mr. Deripaska has been terminated on the basis that Mr. Cherney will make no claim against the shares or assets of the Company or Mr. Deripaska.” Omitted is Deripaska’s acknowledgement that he is paying compensation to Cherney for the release of liability, and that the cash required may be coming from Rusal, directly or indirectly. Also omitted are other legal proceedings exposing Rusal’s cost accounting for “related parties”. One of the targets identified by a source in the new investigations and proceedings is Alumtrade Limited, a Cyprus company. It is owned by Rusal entities in the British Virgin Islands and Jersey; and has had more board directors than office staff. In January of this year, Alumtrade replaced its Cypriot directors and company secretary with another set of Cypriots. The references to tolling and to “persons registered in offshore zones” imply a focus by the examiners on Cyprus-registered and other companies which the Rusal financial reports refer to as related parties. But this hasn’t happened. A discussion of the Accounting Chamber report on Rusal has been scheduled at a session of Chamber presidium on November 30; no public release will be made until the following week. The Chamber will not be reporting on Latvian bank operations by Rusal, nor Cyprus payment issues.